Police said they are investigating a fatal accident which occurred about 2:20 Wednesday morning on the Lethem Public Road that resulted in the death of pedestrian Devon Fraser, 28, a Guyana Defence Force Lance Corporal of Buxton, East Coast Demerara. “Investigation revealed that the deceased was in the company of another walking on the eastern side heading south when Motorcycle CG (Number Unknown) proceeding allegedly at a fast rate heading in the same direction collided with Fraser from behind,” police said in a statement. As a result of the impact, the pedestrian and the cyclist received injuries about their body. They were taken to the Lethem Regional Hospital where Fraser was pronounced dead on arrival and the cyclist was admitted a patient. The body is presently at the said Hospital’s Mortuary awaiting a post-mortem examination. The cyclist, 39, of Central Lethem was tested and found to be above the legal limit of alcohol consumption is assisting in this investigation. was in Lethem to provide musical accompaniment for the activities in observance of Lethem becoming a Township. 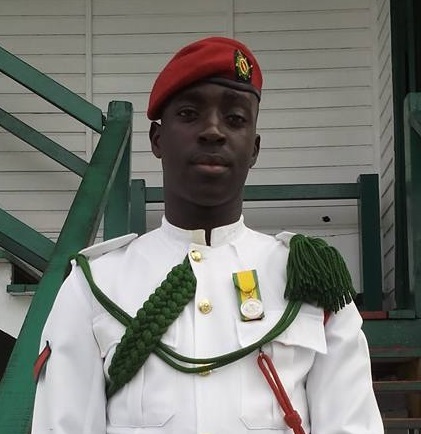 It was reported that LCPL Fraser was walking along the corner of the roadway, in the vicinity of Camp Kanuku, (the GDF Base in Lethem) when he was hit from behind by 39 year old motor cyclist Elroy Pedro, who was riding a black and red 250cc Honda. “LCPL Fraser and Pedro were both taken to the Lethem hospital, Fraser who was suffering from blunt force trauma succumbed from his injuries at approximately 0330 hours,” the GDF said in a statement. LCPL Fraser is survived by his wife; who is expecting the delivery of their daughter; an eighteen month old son, his mother and siblings. The Body of the late LCPL Devon Fraser was due to be flown to Georgetown on Sunday. “An inquiry into the circumstance surrounding the death of LCPL Fraser has been ordered,” the army said.